We’re are Disciples, that We May Go and Evangelize the World, So that the Kingdom of God May Increase. East Bethel is a SPIRITUAL GROWING Church. East Bethel is a WORSHIPPING Church. East Bethel is a RELATIONAL Church. East Bethel is a GIVING Church. And I say also unto thee, That thou art Peter, and upon this rock I will build my Church; and the gates of hell shall not prevail against it.” With these words, Jesus spoke the Church into existence and East Bethel’s legacy of love began. Without question, the Church was birthed out of a legacy of love. God’s love for us, lead to Christ being born and Christ’ love for us lead to His Church being born through His great sacrifice for us. Because of His legacy of love, we all have a Legacy to leave. When Rev. Gideon Porter set out, he did not have a sanctuary or edifice and along with a small group of believers, he held worship services in temporary dwellings until 1929 when God blessed them with East Bethel’s first place of worship at 2409 Live Oak St. in Houston’s Third Ward Community. From 1926 until 1939, Rev. Porter under God’s direction lead the East Bethel family on their legacy of love and God added to the Church Spiritually and Numerically. In 1939, God called Rev. C. L. Larry to continue the legacy of love of leading the East Bethel family and Rev. Larry did so faithfully until 1950. Because this legacy of love had been ordered and ordained by God, East Bethel continued to grow and be a beacon for the community it served. Despite his brief time with East Bethel Rev. Nash Pastored the flock as God ordained in 1951 and in that same year God called Rev. C. A. Saunders to lead His Church. East Bethel’s legacy of love continued with Spiritual growth as saved souls came into the fold. Rev. Saunders served as Pastor until 1955 when God sent Rev. L. R. Dornes to continue leading this flock of believers on their legacy of love. While under Rev. Dorne’s leadership and God’s direction East Bethel worked to renovate their aging sanctuary as God continued to add to the family. When God called Rev. Dornes to Pastor in Beaumont, Texas in 1967 He sent Rev. H. B. Sampson, Jr. to continue leading and guiding His Church on their legacy of love. Shortly after Rev. Sampson began his Pastorship, God called for the leaders of East Bethel to seek a new place of worship for His children. The building at 2409 Live Oak had served His children well, but age had begun to show and God knew His plans to prosper and grow East Bethel meant a new House of Worship. Despite obstacles from the enemy, Jesus’ words in Matthew 16:18, echoed loudly, and on the first Sunday in May of 1970, East Bethel moved into their current edifice at 5702 Calhoun Rd. During Rev. Sampson’s Pastorship, pews were added to the sanctuary, a Choir stand and Pulpit were erected and a Baptismal pool was purchased. God added to His flock and East Bethel continued its legacy of love of Spiritual and Numerical growth. In 1988 God called Rev. Sampson to lead a flock in Seattle, Washington and the East Bethel family knowing God promised in Jeremiah 3:15; “And I will give you Pastors according to mine heart, which shall feed you with knowledge and understanding,” began seeking God for a new Shepherd to continue their Legacy of Love. 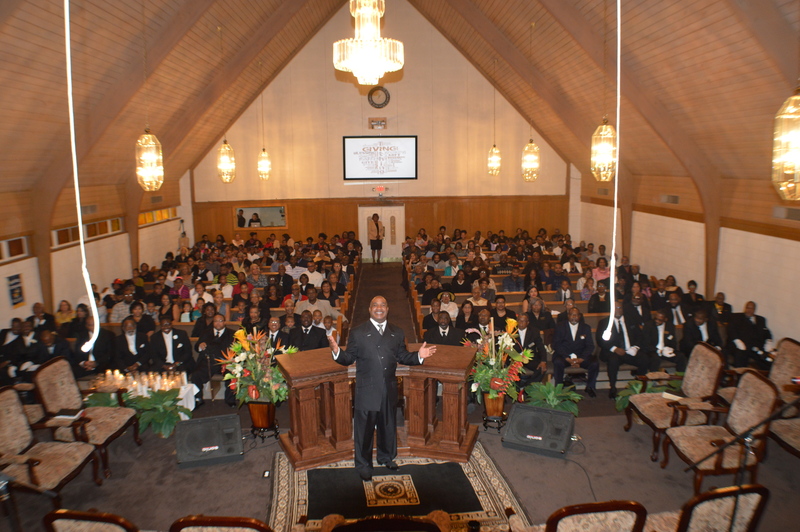 After two years God sent His leader forth and East Bethel began its legacy of love under the leadership of Rev. Dr. Ronald K. Mouton, Sr. God sent this mighty oak in August of 1990 and he has faithfully lead East Bethel on its legacy of love for 25 years and counting. As Pastor Mouton has followed God’s vision for East Bethel, the Church has flourished and added souls. Improvements to East Bethel have included, but are not limited to; paving the parking lot, erecting a marquis sign, enclosing the outer perimeter, adding an in-floor baptistery, renovating the Sanctuary and adding new restrooms and office space. East Bethel currently has a Ministerial Staff of Thirteen. Through our Community Development Ministry, East Bethel works to serve the community around it as well as the Houston Community at large. Because Pastor Mouton is dedicated to God’s call, his teaching and preaching has lead many souls to God. He is a Faithful Servant of God who has stood Strong in times of Adversity and Heartache to keep East Bethel moving on its Legacy of Love.